Project “Dead End “ initiates the idea of reconsidering new theater and concept of artist and also inovative ideas in theater. Initiative is the word that means asking the question. And asking the question “What is art?” always takes us to critical attitude. Through horror-humorous story we try to pay attention of public to “death of the art” and search for the new comunication codes. Seven mortal sins and seven virtues projected to theatre are involved in the story of dramatic triangle: persecutor- saviour- victim. The relationship between performers, director and audience is constantly being changed. Arts: Predrag Radovancevic, Ana Bastac, Julia Gorosito, Nenad Milosevic/Branislav Jeremic, Lidija Antonovic. Thanks to: Station-Service for contemporary dance, Sasa Bozic, Tkh-Ivana Ivkovic, Iskra Gesoska, Milan Markovic, Minja Bogavac, “Lujo Davico” school. 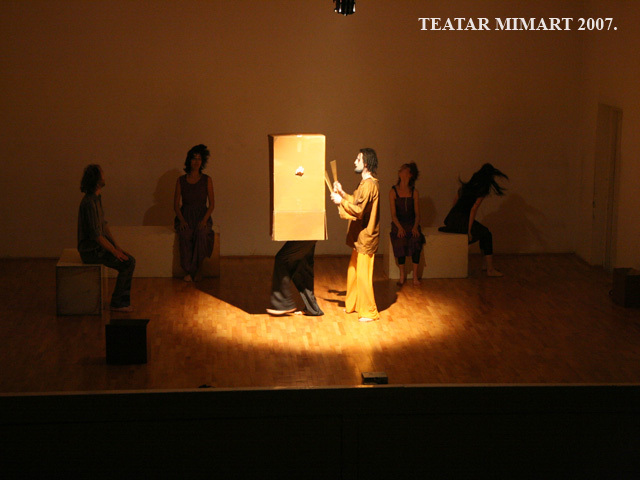 New project of “Mimart” theater, “Dead End” questions diferent forms of art with accent on inovative in theater. Director Nela Antonovic is trying to point mortal sins in art through series of performative pictures. What is art? And where does its honesty ends. That is a big question that performance “Dead End” solves in variety of answers, leaving the audience to find its own right way.